My parents thought I would make a good doctor or engineer. I excelled at science and math, after all. Instead I chose to pursue journalism, even though it seemed better suited for a “creative person” than for me. I had a passion for writing but not necessarily a flair, and my early efforts were not pretty. Fortunately, as this special newsstand edition shows, creativity is not just something you're born with. Most of us have more of it than we realize. 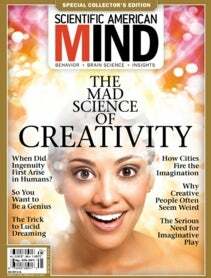 What makes some people more creative than others? In “The Unleashed Mind,” Shelley Carson writes that genetic variations may make some people's brain more open to thoughts, sensations and behaviors that don't make it past the average person's mental filters. These same variations may also explain why many highly creative people seem eccentric at times—or even suffer from mental illness. Despite these genetic variations, “nurture may still account for the lion's share of genius,” writes Dean Keith Simonton in “The Science of Genius”. Practice, training and exposure to unfamiliar ideas and experiences play essential roles in shaping creativity. Even something as simple as living in a big city promotes creativity because close contact with other humans breeds new ideas, explains Edward Glaeser in “Engines of Innovation”. Dreams and imaginative play can also nurture creativity. Dreaming may allow ideas to incubate during sleep, leading to inspiration during waking hours, writes Deirdre Barrett in “Answers while You Sleep”. Daydreaming can likewise fire up neurons that give you access to ideas and solutions hovering below the surface of your consciousness, as Josie Glausiusz writes in “Living in an Imaginary World”. Stimulating the brain with a weak electric current to make the left hemisphere less dominant may even boost creative thinking, according to Allan W. Snyder et al. in “Switching on Creativity”. A panel of experts reveals other powerful techniques for cultivating originality in “Let Your Creativity Soar”. As it turns out, creativity is just as important in medicine and engineering as it is in journalism. In “Your Fertile Brain at Work,” Evangelia G. Chrysikou explains how innovation can elevate the careers of chefs, university presidents, psychotherapists, police detectives, teachers, engineers, architects, attorneys and surgeons. We hope this special issue will help you unleash your own creative self.